I read this first Inspector Morse mystery in honour of the author who passed away this week. In fact, I have the set of thirteen Morse novels and I really must be getting on with them. I deliberately read this first one fairly intensively, if only to keep the complex storyline fixed in my head, but the central characters - Chief Inspector Morse and Detective Sergeant Lewis - popularized in the ITV adaption, come together for the first time here and offer the prospect of a burgeoning relationship. Of course, once exposed to the TV characters, as one reads it's hard not to conjure up a mental picture of John Thaw and Kevin Whately, even if the Chief Inspector is driving a Lancia. 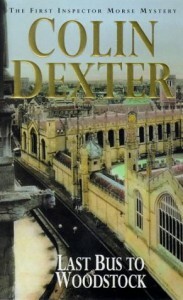 Like Morse, Colin Dexter's writing style is complex and his plotlines intelligent and sophisticated. A former graduate of Cambridge, it is curious that the author should choose to set his series of novels in Oxford. Yet, the backdrop of dreaming spires and college cloisters surrenders a potential wealth of articulate, affluent characters linked to this seat of learning, alongside the harsher reality of city life in the Thames valley. Following the well-trodden footsteps of Sherlock Holmes, in Morse we are enthralled by the detective's superior intellect, in spite of the character's equally obvious flaws. And in DS Lewis, Morse has the perfect foil, whereby blunt common sense and diligent police work enables the more florid, ale-fuelled genius to flourish. In a sense, the emotional vulnerability displayed by Morse in his pursuit of a 'love' interest is surprising, but his ineptitude in the relationship department is nonetheless endearing. In this opening story, Morse and Lewis are beginning to find the measure of each other and formulating a working relationship, which meshes their respective strengths, but the sparks between them also also keeps this partnership interesting, with more to come. As well as the crime (in this instance murder), the key to the crime novel is often how the 'solution' is unpacked and here Dexter has Morse subtly explain his 'working out' to Lewis. The conclusion is slightly melodramatic for my taste, but a giant among literary detectives began his rise to popularity with this book. Twelve books to go. How exciting! And what an exceptional body of work!